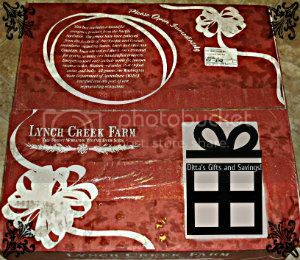 This Christmas Wreath review is being brought to you by Lynch Creek! Lynch Creek, a Family~Owned Business was Established in 1980. Still going strong and expanding and exploring every day! I received a Christmas Wreath to review, the best part of this was I did not chose what I wanted, all that was said is that they were going to send me their most popular Christmas Wreath Product! So it was like Christmas in October at our house! I was so excited when it came! Here was this Christmas decorated box that the Christmas Wreath comes in. Once I sliced the tap that sealed the box, all I could smell was the amazing aroma of Pine. Oh it is Christmas time now! I proceeded to open the box. Once opening the first 2 flaps there are instructions! There was a surprise setting on top of the Christmas wreath, a wreath hanger! Oh yes, and oh no! I am so glad they put that little gift in there because guess what!? I did not even think how I was going to hang the Traditional Christmas wreath. Ok next step, I then opened the Rustic Wreath hanger and picked up the plastic that was covering the wreath. Oh wow! This is beautiful! I was like a little kid opening the gift that I had wanted my whole entire life! 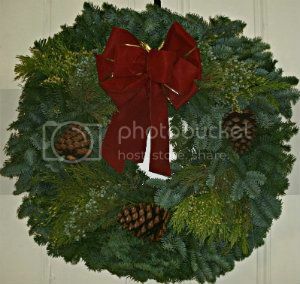 This wreath is so beautiful with a big red bow at the top and 3 pine cones evenly placed around it. They have sent me the Traditional Christmas Wreath! 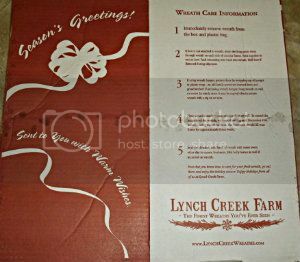 I recommend Lynch Creek Farms for all of your Live Christmas trees, wreaths, swags, etc. Here is your Chance at a $25.00 Store Coupon!! You must respond to winning email from (rondimk322@gmail.com) within 24 hours or another winner will be drawn! *Loves 2 Read is not responsible for prize distribution. This is not a review by Loves 2 Read. I have made a lot of the gifts as I knit. I have made a few scarves and a sweater and a dress. I've purchased a pillow pet, DVD, T-Shirt and a few gift cards. Just a tiny start! I'd best get moving!! A video game for my son and something for my mom.